When it comes to helping their residents get around without breaking the bank, California, Oregon, Washington, Massachusetts, and New York are the top five states in the nation, while Nebraska, Alaska, Mississippi, Idaho, and North Dakota bring up the rear. That’s according to a new report by the Natural Resources Defense Council. NRDC ranked every state on their policies to reduce oil dependence, as well as their actual performance, based on per-capita spending on gasoline as a percentage of income. Among the measures that NRDC rewarded for giving residents more freedom from fuel price volatility: 13 states are actively promoting smart growth policies, and five states have set targets to reduce overall vehicle miles traveled (VMT). NRDC also gave credit to states that had developed fuel efficiency standards or were taking action to encourage the use of alternative fuels. The four top-ranked states have all set targets to reduce VMT or petroleum consumption, and three of the top five states are also among the top five in transit investment. The lowest-ranking states, meanwhile, were all without any substantive policies to reduce fuel consumption or promote travel options besides driving. NRDC found a substantial overlap among states that had the worst fuel policies and the states where residents end up taking the biggest hits at the pump. 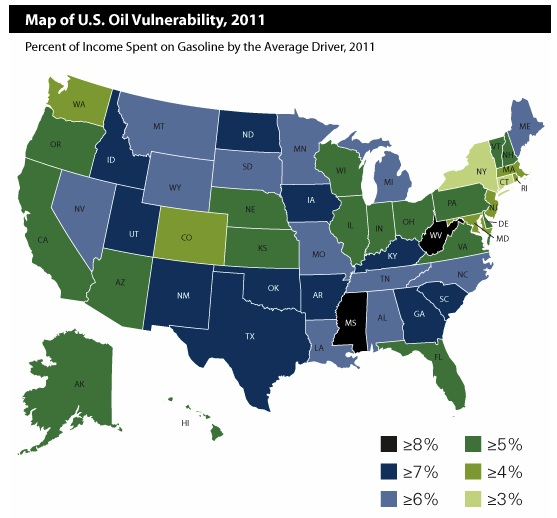 Residents of Mississippi, West Virginia, South Carolina, Kentucky, and Oklahoma spend the highest percentage of their income on gas. The point of the report, said NRDC Executive Director Peter Lenher, is not to shame the most oil-dependent states, but to provide inspiration and examples from the places that are leading the way toward a more resilient future. You check out all the rankings in the full NRDC report. This doesn’t surprise me. When I was in Omaha, I missed the 6pm bus to the airport and then found out that it was the last of 6 that day. Of course New York looks good–with all those New York City subway riders who don’t even own a car. If the NYC metro area were split off from “upstate” NY, it might look quite a bit different. Yeah, I was going to say what Davistrain said — the situation in upstate NY is poor. It’s probably nowhere near as baad as Mississippi or West Virginia, but I’d expect it to look as bad as Vermont. How Gas-Dependent Is Your State?